Arizona is famous for its desert climate, and while locals and snowbirds alike enjoy our milder winters, the warmer seasons of the year can be brutal on both your body and your car. Installing car window tint or film is a simple, low-cost upgrade you can make to your vehicle that makes surviving our warm springs and hot summers easier. Below, we’ve laid out 3 benefits of adding window tint to your car. 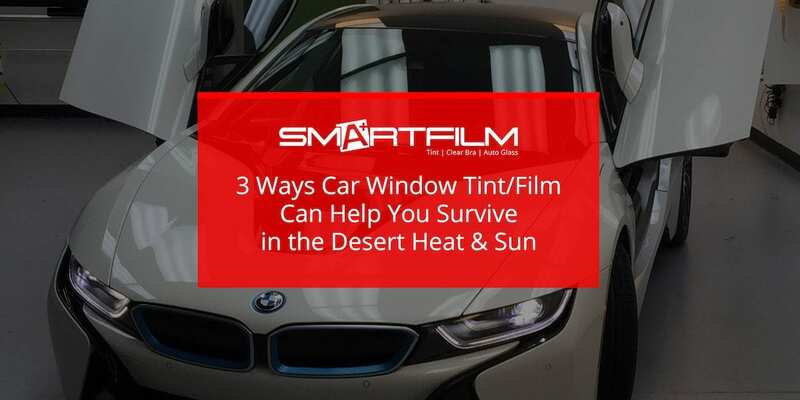 One of the greatest benefits of installing car window tint and film in Arizona is the UV ray blocking that it provides, protecting against skin damage and vehicle interior fading. 3M crystalline window tint blocks about 99.9% of UV Rays. Arizona is notorious for its extreme heat. Driving in 100-degree temperatures is not only uncomfortable but dangerous, from potential heat strokes to burning yourself on metal or leather car parts. Darker automotive tint insulates your vehicle against heat and keeps your interior cooler for safe and comfortable driving. Valley drivers know that A/C is vital for surviving summer, but it’s easy to overwork your A/C. Car window tint/film reduces heat and sunlight, keeping your vehicle’s interior cool and reducing A/C use. This keeps your A/C is in good condition all summer long and lessens stress on your engine, preserving the longevity and resale value of your car. Contact Smartfilm and Set Up Your Installation Today! It’s easy, low-cost, and effortless to invest in car window tint and film for your Arizona vehicle, and the return you’ll experience on your investment is priceless. From increased driving safety and comfort to extending the life and preserving the look of your vehicle, what’s not to love? Call us today and schedule an appointment with one of our local technicians to learn more!